The eighth-ranked Buckeyes need a rally before stopping the Cornhuskers late in the game. COLUMBUS, Ohio — J.K. Dobbins ran for three touchdowns and Dwayne Haskins Jr. passed for two more Saturday as No. 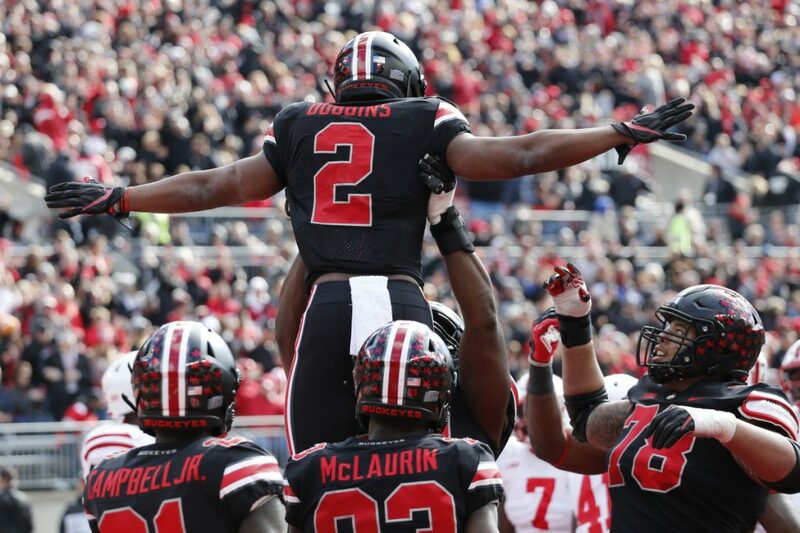 8 Ohio State rallied in the second half and held off Nebraska, 36-31. After Adrian Martinez of Nebraska (2-7, 1-5 Big Ten) threw a 17-yard touchdown pass to J.D. Spielman to pull within five with three minutes left, Dobbins pounded away for two first downs to run out the clock for the Buckeyes (8-1, 5-1). (2) CLEMSON 77, LOUISVILLE 16: Travis Etienne rushed for 153 yards and two touchdowns, and 350-pound defensive tackle Dexter Lawrence added a 2-yard TD burst as Clemson (9-0, 6-0 Atlantic Coast) defeated visiting Louisville (2-7, 0-6). (5) MICHIGAN 42, (14) PENN STATE 7: Shea Patterson accounted for three touchdowns and Michigan (8-1, 6-0 Big Ten) put together a dominant performance on defense to beat Penn State (6-3, 3-3) at Ann Arbor, Michigan. (6) GEORGIA 34, (11) KENTUCKY 17: D’Andre Swift ran for a career-high 156 yards and two TDs on 16 carries and Georgia (8-1, 6-1) beat Kentucky (7-2, 5-2) at Lexington, Kentucky, to wrap up its second straight Southeastern Conference Eastern title. (12) WEST VIRGINIA 42, (15) TEXAS 41: Will Grier threw a 33-yard touchdown pass to Gary Jennings with 16 seconds left, then ran in the 2-point conversion to send West Virginia (7-1, 5-1 Big 12)over Texas (6-3, 4-2) at Austin, Texas. MISSOURI 38, (13) FLORIDA 17: Drew Lock threw three touchdown passes to lead Missouri (5-4, 1-4 Southeastern) over Florida (6-3, 4-3) at Gainesville, Florida. ARIZONA STATE 38, (16) UTAH 20: Manny Wilkins threw three TD passes to N’Keal Harry and Arizona State (5-4, 3-3) beat Utah (6-3, 4-3) at Tempe, Arizona to knock the Utes out of sole possession of the Pac-12 South lead. PURDUE 38, (19) IOWA 36: Spencer Evans made a 25-yard field goal with eight seconds left, giving Purdue (5-4, 4-2) an upset over Iowa (6-3, 3-3) at West Lafayette, Indiana, and putting the Boilermakers back in the Big Ten’s West Division title hunt. (22) SYRACUSE 41, WAKE FOREST 24: Eric Dungey rushed for 119 yards and a TD, Jarveon Howard ran for two scores and Syracuse (7-2, 4-2 Atlantic Coast) beat Wake Forest (4-5, 1-4) at Winston-Salem, North Carolina. (24) BOSTON COLLEGE 31, VIRGINIA TECH 21: Travis Levy ran for two touchdowns and Boston College (7-2, 4-1 Atlantic Coast) beat Virginia Tech (4-4, 3-2) at Blacksburg, Virginia, to set up a huge home game against Clemson next week. AUBURN 28, (25) TEXAS A&M 24: Seth Williams caught an 11-yard touchdown pass from Jarrett Stidham with 1:41 left and Auburn (6-3, 3-3 Southeastern) rallied to beat visiting Texas A&M (5-4, 3-3). HARVARD 52, COLUMBIA 18: Tom Stewart passed for 393 yards and a school record-tying five touchdowns, including the three longest scoring strikes in Harvard history – 92, 75 and 74 yards – and the Crimson (4-4, 2-3 Ivy) rolled over Columbia (4-4, 1-4) at Boston. NEW HAMPSHIRE 35, JAMES MADISON 24: Evan Horn and Rick Ellison returned interceptions for first-half TDs and New Hampshire (3-6, 2-4 Colonial Athletic) upset James Madison (6-3, 4-2) at Durham, New Hampshire. HOLY CROSS 40, LAFAYETTE 14: Domenic Cozier ran for three touchdowns, Geoff Wade threw for two scores and Holy Cross (3-6, 2-2 Patriot) beat Lafayette (3-6, 2-3) at Worcester, Massachusetts. PRINCETON 14, DARTMOUTH 9: John Lovett ran for two touchdowns and Princeton (8-0, 5-0 Ivy) held off visiting Dartmouth (7-1, 4-1). ELON 24, RHODE ISLAND 21: Jaylan Thomas ran for 222 yards and scored a touchdown to help the Phoenix (6-2, 4-1 Colonial Athletic) beat visiting Rhode Island (5-4, 3-3). DELAWARE 21, ALBANY 16: Kani Kane scored on a 4-yard run with 18 seconds left and visiting Delaware (7-2, 5-1 Colonial Athletic) avoided an upset by beating Albany (2-7, 0-6).